Please use our online form to communicate your interest in joining the Better Breathers Club - Chicago, IL. This Better Breathers Club will held on a monthly schedule. Contact Gail Harris at (312) 864-2923 for details at the John H. Stroger Hospital/Cook County Hospital in Chicago. All Club sessions will run from TBD. 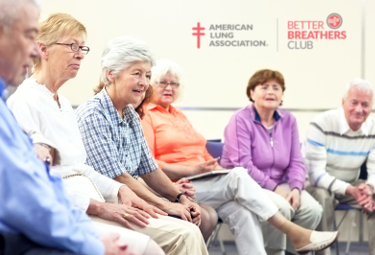 We invite you to attend a Better Breathers Club meeting on Tuesday, April 9th between 12:00 - 1:00 PM to learn about sarcoidosis and engage with others also living with chronic lung disease. Festivities include a guest speaker, networking, refreshments, a raffle and other giveaways.